The last really expensive trip we took was so uncomfortable. It's so lazy. I want somebody to give me a great $30 massage as opposed to a bad $265 massage. It takes me 10 minutes to get ready to go out, and that includes the shower. The next couple of jobs will determine, at least from a business point of view, if I'm a guy who's actually the real thing or I'm a guy who's had a nice moment. When I was in jail I could only think about what the average person has to go through - the person who has no power to go to the press or no money to hire a lawyer. I remember at the premiere of my second movie I started crying. I thought, I'm so bad that I either have to stop this and do something else or learn what I'm doing. I have to tell you, you can't have an ego when you're an actor. A lot of actors have them, but in reality most of those people are just sensitive artists dying for a hug and a compliment. I love the competitive part of stocks. A lot of fear and greed, that's all it is. All I see is green and red. I only took a high school acting class because there was no other class I wanted to take. I loved it, but I was always against acting as a profession. I didn't like the monetary fluctuations I saw. I'm very happy to be involved with great filmmakers. He became interested in acting after taking an improv acting class in high school. after an altercation at the Stray Cat Bar in Shreveport Louisiana. The site has since shut down. 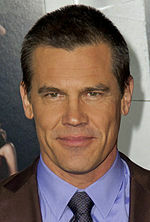 He is known primarily for his roles in the films The Goonies W. Josh James Brolin (/ˈbroʊlɨn/; born February 12 1968) is an American actor.